US Mint collector silver coin sales declined from earlier heights during the last several days. Some pullback is to be expected given there is that initial spike with new coin launches, and then an easing as the days go by. However and most interestingly, new stats for the sold out Lincoln Silver Dollars actually dropped significantly. For the numbers, last week a total of 465,614 Lincoln commemoratives were listed as sold from a possible maximum mintage of 500,000. That seemed a bit of a dilemma considering 50,000 were supposed to be allocated for a five-coin proof set yet to be released. The dilemma has disappeared. The latest Mint figures show a negative adjustment. Now 450,000 proof and uncirculated Lincolns are shown as sold, resulting in a 15,614 decline. Braille $1s and 2009 silver quarters are moving nicely. Sales, as previously alluded to, have slowed compared to their initial launch week. A combined 70,274 proof and uncirculated Braille Silver Dollars have been purchased. The last reported total was 40,844. 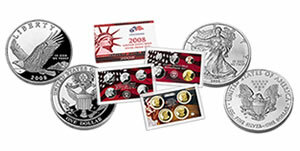 Finally, sales of 2009 DC & US Territories Silver Proof Set have jumped to 75,301, rising 20,141 over the last figures. * Coin products with an asterisk have been sold out or are no longer available. The previous reported sales figures are located at Braille Silver Dollar Sales Near 41,000 in First Week. As a reminder, the collector silver eagle suspension is still in affect. Visit the CoinNews collector tool page Mint Price Guide for tables of common gold and platinum coin stats. Additionally, NumisMaster has a breakdown of the latest sales figures for most Mint coins here.